GM Vortec gaseous-fueled engine: Long-life, heavy-duty, 4-cycle, spark ignited engine from a world renown manufacturer for economy of operation and maximum reliability and durability. Capable of full load acceptance in one step. Cooling: Radiator with belt driven pusher fan. Filtration: Heavy-duty replaceable element air cleaner. Alternator: single bearing, 4-pole, rotating field, self-excited, self-ventilated, 60Hz, brushless alternator with Class H insulation. Automatic voltage regulator (AVR) providing close voltage regulation. Winding temperature rise of 130Â°C at standby rating. 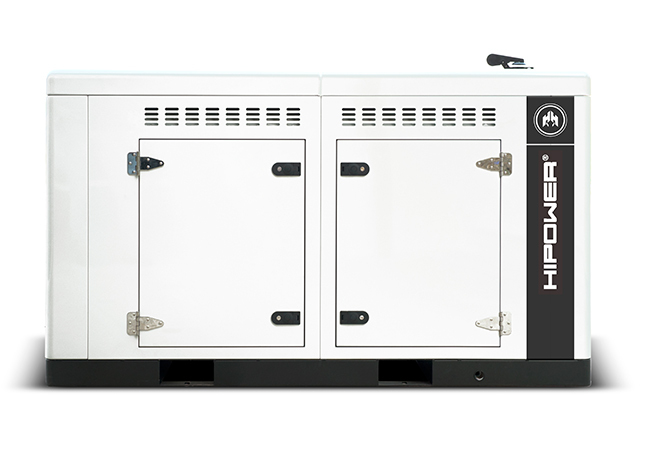 Certification: Generator sets are UL 2200 and CSA certified and meet ISO 8528-5. Arrangement: Open skid with engine and alternator units close coupled together and with resilient anti-vibration isolators mounted between the assembly and a heavy-duty steel base. The sturdy base frame has openings allowing for winching, slinging and forklift pockets for ease of handling. Auto Start Control Panel: Digital auto-start microprocessor based control panel with remote start capability. Starting system: 12 volt starter motor, battery cables, battery and belt driven charging alternator. Dimensions Open 78.0" x 42.0" x 36.0"
Dimensions Lv1 102.0" x 42.0" x 53.0"
Dimensions Lv2 102.0" x 42.0" x 53.0"
Noise Open 81 dBA @ 23 ft. Noise Lv2 71 dBA @ 23 ft.